We are a region defined by innovation. A place where technological advancements transform the world’s products and processes. Where game-changing research & development leads to new discoveries. And where industries set new standards for the global marketplace. Access the funds you need to help your business grow. Moving or expanding? Find the building or site that fits your needs. 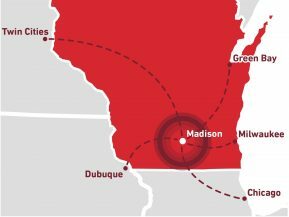 View facts and figures about the Madison Region economy. City officials participated in the ceremonial groundbreaking ceremony at MacDon’s new research and development facility in the Sun Prairie Business Park on March 27th. Mayor Paul Esser and Council President Bill Connors were joined by Michael Gay, Senior Vice-President of Economic Development for the Madison Region Economic Partnership, and Melissa Hunt, Regional Economic Development Director for the Wisconsin Economic Development Corporation (WEDC). The Madison Region Economic Partnership (MadREP) and the Urban League of Greater Madison (ULGM) are pleased to announce former NFL Player Wade Davis will speak at the 6th Annual Summit on Friday, May 17 at Monona Terrace. The Madison Region Economic Partnership (MadREP) and the Urban League of Greater Madison (ULGM) are pleased to announce Paulita David, Director of Multicultural Strategies at McPherson, Former Head of Multicultural at Google will speak at the 6th Annual Summit on Friday, May 17 at Monona Terrace.